Prime Minister Saad al-Hariri's government is finalizing a 2019 state budget expected to follow through on its promise of "difficult and painful" reforms to put the public finances on a sustainable path. "What is required from us as a government today is to carry out a budget that may be the most austere in the history of Lebanon," Hariri told reporters after a meeting of parliament, saying the government must be "sincere" with the people. While Lebanon was not in "a state of collapse", Hariri said that "if we continue like this we will reach a catastrophe". Unlike other states that had suffered financial crises such as Greece, Lebanon would have no-one to save it, he added. He held out the possibility of austerity measures that might last for a few years after which "things will return to how they were". He also hinted at cuts to benefits enjoyed by some state workers such as overtime, furniture expenses and cars. "Why should I make the Lebanese people bear all these costs?" he said in his comments to reporters. "We are certainly in a difficult time," he said. As part of its reform effort, the government last week approved a plan to overhaul the state subsidized power sector that is a major drain on finances. 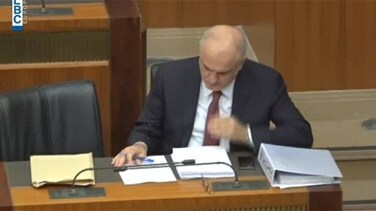 Parliament approved the plan at Wednesday's session.